At one time or another during a pregnancy, most women wonder about what will happen should they not be able to make it to the hospital on time. This concern hits home even more for the moms-to-be who are due during the Winter months. With a snow storm around every corner, black ice and sleet impeding their path to the hospital, what would a mother in labor do in the event that she couldn’t get to the hospital to birth her baby? First, stay calm. It might sound easier said than done, but nothing productive will ever come from flipping out. In fact, all that stress can actually delay labor. That might sound ideal in a situation where you don’t want to give birth before you’re in a doctor’s care, but delaying labor when it’s already in progress is never a good thing. It can lead to the need for interventions that aren’t readily available for a woman who isn’t close to the hospital. When a woman is under stress, the body produces cortisol. That cortisol impedes the release of oxytocin, which keeps contractions coming at regular intervals. Those contractions help to move the baby downward. The pressure of the baby on the cervix helps it to soften further and dilate. Thus, without cortisol, all of this could come to a screeching halt. The best thing you can do if an unexpected delivery outside of the hospital could potentially happen is to be prepared for it. This goes not only for the event of birth itself, but the mental and physical fortitude of the mother-to-be, too. Being prepared for birth involves a little bit more than knowing how and when to breathe. If the roads are bad, it is best to attempt to have a home birth, not a roadside birth in the freezing cold. There are supplies that expectant parents may want to have on hand. Scissors will be important to cut the umbilical cord after it has stopped pulsating. These can be sterilized in boiling water. If you don’t have rubbing alcohol on hand at home, vodka is a decent substitute. Even though the ambulance may not be able to make it through the snow and slippery streets to get to you, you will want to call 911. In many cases, they will dispatch you through to your doctor or a paramedic who may be able to help and assist you during the birthing process. Trash bags make an excellent barrier to protect mattresses and other surfaces so that Mom’s amniotic fluid and other birth fluids don’t stain or ruin your bed or sofa. The Internet can be a great tool during this time, too. While it may not be the best resource for a crash course in how to deliver a baby, it is a great choice for music during labor or reaching out to friends and family via social networking to see if anyone nearby can come to your aid. If you are home alone and don’t have a partner to help you with the delivery, a neighbor is the next best thing. Whoever can get to you will do. If no one is around for miles by some chance, rest assured that women have been having unattended and unassisted births for years. It is both possible and safe. Spend the initial hours of early contractions walking, reading or watching television. Take this time to sit down and write a letter to your new baby boy or girl for them to open and read when they’re older. Tell them about your emotions in that moment. This is a great tool to use to keep the mood upbeat and exciting instead of anxiety-ridden and fearful. There is nothing to fear. Women have been having babies at home for centuries. In fact, much of the research on home births supports it being just as safe as hospital births. Plus, the risk of interventions is far lower. Many women worry about the pain of childbirth. This is totally normal. If you were planning a natural birth, congratulations — you’re about to accomplish just that. If you had your sights set on an epidural or other pain relief, try to relax. Tension will only make contractions more uncomfortable. Keep in mind that there are lots of pain management techniques you can employ during childbirth that don’t involve drugs. This does not have to be a terrible and debilitating experience. One alternative for pain relief is getting into the shower or bath tub. Submersion in water is a great technique that takes the edge off of contractions. Keeping the water fairly warm and adding more hot water as needed is the best way to manage this process. You can even stay in the tub and birth there, too. Counter pressure is another great tactic that your partner or support person can use. It involves applied steady pressure on the lower back to counteract the pressure of the baby coming down the birth canal. Remember to change positions throughout labor. While you may have seen the same scene played out again and again in the movies and on television, women in labor should not be laying on their backs waiting for a doctor to tell them when it’s finally time to birth their babies. Keep moving. Let gravity to the work and move that baby down. Push on your hands and knees or even while squatting. Do what feels best to your body. After the baby makes his or her debut, try not to dwell on how things didn’t go as planned. They went how they were supposed to. That is what you should keep in mind. 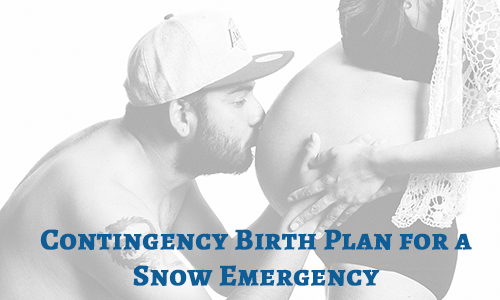 You have a healthy baby and an amazing story that you can tell for the next several decades about the snow storm that forced you to give birth in your bath tub or bed at home. Some might consider that a blessing in disguise.